A soft-spoken economist little known outside his home country of Belgium is the unlikely choice to serve as the first President of the European Union. Belgian Prime Minister Herman Van Rompuy  known as Haiku Herman for his love of penning poetry  was chosen Thursday by leaders of the E.U. 's 27 member states to serve as permanent President of the European Council. The low-profile Van Rompuy, 62, emerged as a favorite after former British Prime Minister Tony Blair failed to win over liberal E.U. leaders, in part due to his support for the invasion of Iraq. Though he offers little international experience, Van Rompuy has won praise for bringing stability to his nation's fractious politics and, before that, helping balance its financial books. A strong opponent of Turkey's admission to the E.U., Van Rompuy begins his 2½-year term on Jan. 1.  Born Oct. 31, 1947, in Brussels. Attended Sint-Jan Berchmans College, a Jesuit school in the Belgian capital, before studying philosophy and economics at the Catholic University of Leuven.  Worked at Belgium's central bank from 1972 to 1975. Became active in the Flemish Christian Democrat party beginning in 1973, and headed the party from 1988 to 1993.  Served as Belgium's Budget Minister and Deputy Prime Minister from 1993 to 1999. A budget hard-liner, he successfully lowered the country's significant debt load. He later joined Belgium's Parliament, leading the lower house from July 2007 to December 2008.  Appointed Prime Minister in December 2008  the country's third in less than a year (his predecessor, Yves Leterme, stepped down after nine months amid allegations that his aides exerted improper influence over the dismantling of a major bank). A reluctant leader, he reportedly required 90 minutes of persuasion by King Albert II to accept the position.  As Prime Minister, his moderate temperament and fair-minded style has helped calm tensions between the nation's rival French- and Flemish-speaking cultures, easing a rift that once threatened to divide the country of 10 million.  Married with several children and the author of six books on economics and politics. Goes on regular Catholic retreats to the ancient monastery of Affligem Abbey and is known for writing haiku in Flemish. "Turkey is not a part of Europe and will never be part of Europe ... The universal values which are in force in Europe, and which are fundamental values of Christianity, will lose vigor with the entry of a large Islamic country such as Turkey." Van Rompuy "has the big asset of not being in office long enough to make many enemies. He's very much an unknown quantity, but I think that's essentially what a majority of the member states are looking for." 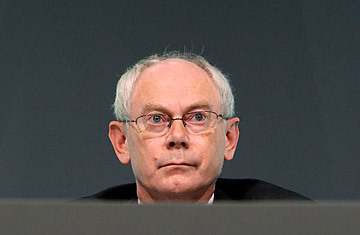 "He's no big hitter, but don't underestimate Herman Van Rompuy. This country was in a terrible state and he's managed to bring peace and stability ... But now, everyone is worrying about what will happen when he's gone." Of talks on iron ore tariffs.